Kale. Can’t get enough of it. Most often I juice it, or steam it & toss it into a simple bowl of quinoa & Bragg’s, but lately I’ve been trying to enjoy it in all of its raw glory. I threw this simple salad together yesterday, as a kick-off to, what I hope to be, a very healthful summer. All of the veggies are seasonal & local – from Suzie’s Farm, with the exception of the avocado, which was from P’s uncle’s tree. I know I’ve touted the benefits of kale in previous posts, but here’s another quick rundown on this superfood. 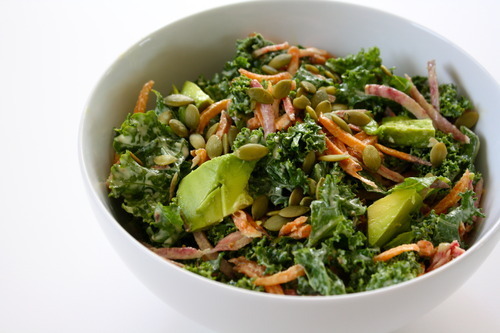 Kale is the “queen of greens” & a nutritional power house. Kale is an excellent source of vitamins, minerals, & antioxidants In fact, kale’s health benefits are primarily linked to the high concentration & excellent source of antioxidant vitamins A, C, & K – which helps lower your risk of developing cancer. Beyond antioxidants, the fiber content of cruciferous kale binds bile acids & helps lower blood cholesterol levels & reduce the risk of heart disease. While it is often said that you will receive maximum benefits from lightly steaming kale, I often enjoy it in the raw, lightly “massaged.” Massaging helps to lightly “wilt” the kale, allowing it to be more fully enjoyed in it’s raw form. Prepare dressing in a food processor & process until smooth. Shred carrots & beets in food processor, or grate by hand. Tear the leaves off of the kale stems & chop into bite-sized pieces. 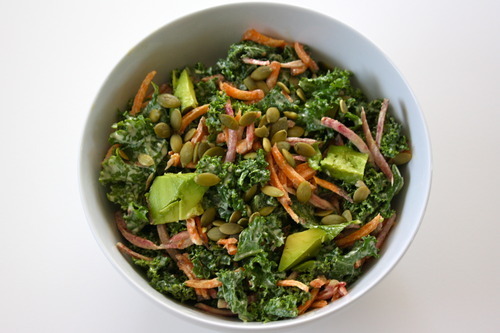 Mix kale & dressing (3/4-1 cup) in large bowl until thoroughly combined, & massage dressing into leaves until just wilted. Add veggies & toss. Sprinkle with pepitas. Place in fridge to ‘marinate’ for 10-15 minutes. Keeps in fridge in a sealed container for 1 day. 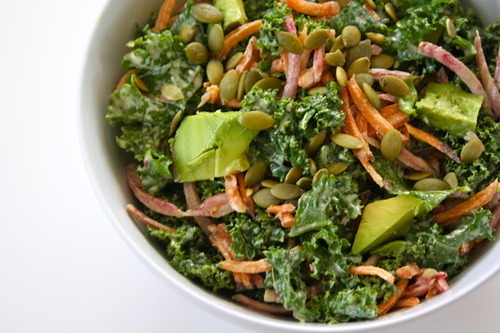 Mmmmm,mmmmm…nothing like a raw kale salad on a warm summer afternoon. I absolutely love this dressing & will be making it often, however, I might reduce the salt by 1/2 a tsp. next time, as the nutritional yeast made it savory enough for me. 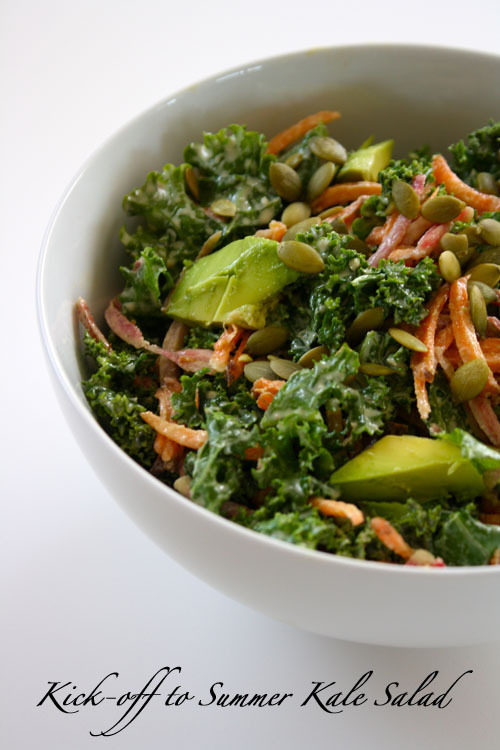 This dressing would be wonderful over my steamed kale & quinoa bowl as well.